Posted October 8th, 2015 by imxperts. Perma-Cote PVC-Coated Conduit – Protecting the water and wastewater industry from corrosion for more than half a century! Conduit systems are designed to protect electrical wiring and equipment, though there are various options manufactured with different materials to choose from. 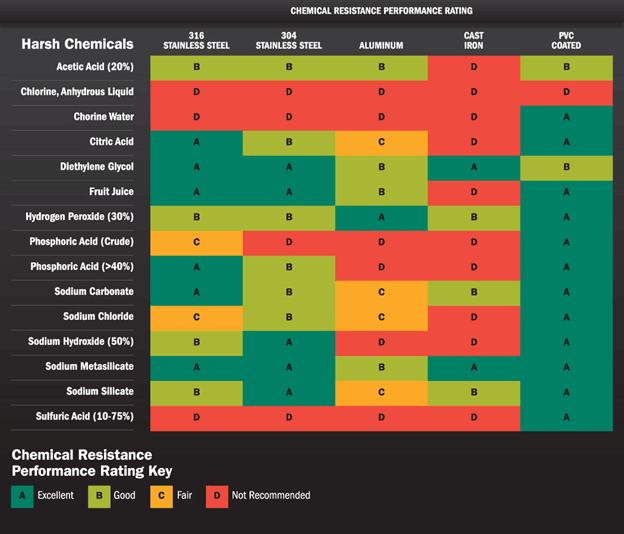 Each conduit material type produces a different reaction with environmental contaminants, and it is important to know which material will be the best at resisting corrosive areas within the water/wastewater environment. 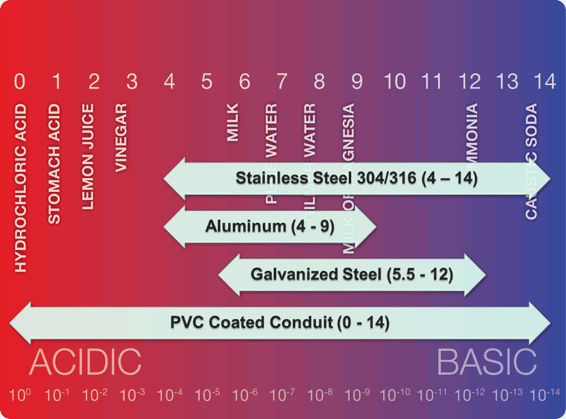 Why do you need a PVC coated conduit partner in strategically preventing corrosion? Corrosion costs are accelerating, in 1998 corrosion costs were $276 billion (3.1% of GDP). In 2002, NACE International and the American Waterworks Association estimate corrosion costs, specific to the water/wastewater processing industry, at $58.6 billion annually in the U.S. alone. Utilities make up approximately 35% of the overall cost of corrosion in the U.S. (that includes gas, electricity, water and sewage). Water and sewage alone account for 75% of the corrosion costs within the utilities sector. Based on the previous studies that would be equivalent to $263 billion in cost associated with water and sewage utilities. Material and labor costs of replacing failed products, including those not providing reliable protection against corrosion, can consume upwards of 50% of water/wastewater facility budgets. Additional lost revenue and costs of corrosion damage — including system downtime and liabilities related to catastrophic failures including loss of life — are hard realities even when not statistically tracked. The Economic Development Research Group predicts that a failure to bring operation efficiency to the U.S. water infrastructure will lead to $206 billion in increased costs for businesses and households by 2020, coupled with a potential loss of nearly 700,000 jobs. Numerous water/wastewater facilities have not been significantly upgraded from the 1970’s. It is estimated that more than $300 billion is currently required to fix problems in sewage treatment plants alone. 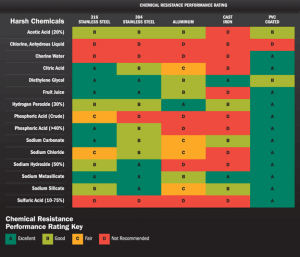 Why do you need a partner in strategically preventing corrosion? Because of the facts above, and due to ongoing reductions in government funding, it is increasingly vital that the water/wastewater industry designs, builds and maintains facilities that perform as needed for the long term. A study by the Executive Branch and Government Accountability office underscores the fact that although corrosion cannot be eliminated, if considered in the design phase of a project, more can be prevented — and doing so could eliminate more than 40% of the costs of corrosion damage! A superior-performance product, such as Perma-Cote PVC coated conduit, even though it may be a small element of any given job, can be instrumental in ensuring protection of entire systems from corrosion. Perma-Cote PVC coated conduit can help reduce potential downtimes and can contribute to extended service life by more than 10 times that of other product options. By eliminating product failure you eliminate the staggering costs of downtime, safety hazards, replacement costs, and related liabilities. Every dollar has to count or the problem will continue to grow. That’s why a corrosion prevention strategy is necessary. That’s why good PVC coated conduit partners in the fight against corrosion are equally necessary. 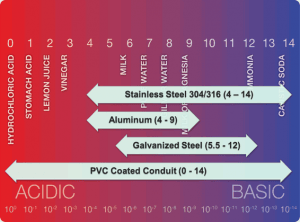 Where should I use PVC Coated Conduit in Wastewater Environments? Sodium Hypochlorite Pump Stations: Sodium Hypochlorite (Bleach) is added into treated water to be used as “Plant Water.” Sodium Hypochlorite pump stations are very corrosive, especially due to the delivery method, which often results in spills. The product is typically delivered via tanker trucks, and the transfer upon delivery usually leads to spills and tank over flows. For this reason, there is always electrical conduit around the facility and pump stations. Protection of electrical wires is crucial, and PVC-coated conduit and fittings are recommended to prevent early failure and high replacement costs caused by corrosion. Polymer Wastewater Sludge: Polymer is pumped into wastewater sludge as a thickening agent. A similar delivery procedure takes place with polymer, which usually results in spills and over flows. Again, PVC-coated conduit and fittings are a must in this type of area. Liquid Oxygen Plant: Liquid Oxygen is used in the industry to produce oxygen to feed, grow, and multiply microorganisms. An on-site liquid oxygen plant can always be seen due to the familiar fog rolling off of it. This means that the plant is in subzero temperatures, causing the electrical conduit to endure a lot of expanding and contracting, which can make wires vulnerable to the corrosive elements present within the facility. Using an ETL-Verified conduit helps maintain the structural integrity of a full conduit system. Waste Activated Sludge (WAS): Hydrogen Sulfide (H2S) is obtained from waste activated sludge, typically by a foul air system. H2S is highly corrosive and usually leaves a white crystalized residue on anything within its vicinity. The H2S will corrode galvanized metals and conduit. When the best performing PVC-coated conduit is specified and in place, contractors can usually wipe off this residue and see that the conduit was un-harmed. Thickened Waste Activated Sludge (TWAS): Waste activated sludge (WAS) undergoes a process that turns it into thickened waste activated sludge (TWAS), which usually takes place in a dome structure. The inside of these domes is probably one of the most corrosive areas found in wastewater facilities. The H2S inside the dome is raw, causing a dense air concentrate to form. Combined with the extremely high humidity inside the dome, moisture and H2S permeate the air to create a highly corrosive environment for electrical components. ETL-Verified conduit is necessary to prevent product failure in such extreme conditions. Broad Range of Use: Due to factors such as heat and humidity which are caused by facility operations as well as the general climate, especially in coastal areas, many facility owners make the choice to use PVC Coated conduit and fittings across their facility. This provides ultimate protection across the facility as well as a continuity in the system.